This family friendly hike hugs the banks of Lake Chuzenji in Nikko. If you arrive early at the Shobugahama campground it makes a nice warm up hike before tackling Mt. Nantai 男体山. It is also an option after visiting the Ryuzu Falls instead of heading up to Senjogahara. From the Ryuzu Falls follow the road down to the overflow car park near Lake Chuzenji. 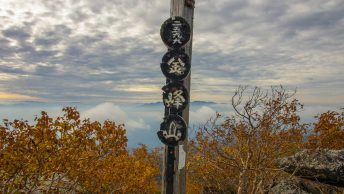 Look for the Senjugahama 千手ヶ浜 signpost which marks the start of the trail proper. The first 30 minutes of the hike dips up and down with occasional exposed areas staked with rope barriers. There are a couple of lookout points to view the lake below. At Akaiwa 赤岩 the trail opens at a flat area beside the lake. The forest mostly comprises deciduous broad-leaved trees such as Urihada maple ウリハダカエデ, Hauchiwa maple ハウ千ワカエデ and Oomomiji オオモミジ which make a striking backdrop when the autumn colours reach their peak in mid-October. Another tree to look out for is the Japanese horse chestnut which inhabits the slopes around Lake Chuzenji. It has been theorised hunters brought them as a food source during the Jomon period as they are not endemic to the area. Also interestingly the lake was once bereft of fish as they were unable to climb up the Kegon Falls. This situation was remedied thanks to the thoughtful release of char, carp and trout in the 1870s. From here until Senjugahama the hike flattens out and tracks close the lake edge. Senjugahama makes a welcome respite to the goings-on at the campground and is great spot enjoy a picnic lunch along its sandy shores. In fine weather it is also one of the better locations to view Mt. Nantai. If you’re feeling particularly energetic it’s possible to hike the entire 25 km Lake Chuzenji Nature Trail 中禅寺湖周回線歩道 which winds its way around the lake. Every day during June and on Saturday’s and public holidays in August and October sightseeing boats make three daily trips between Senjugahama and Shobugahama Pier (15 mins, 380 yen). Thanks David, Our family lived in Japan and enjoying the pristine nature was a highlight. This is an other jewel for going with kids. I’ll invite you a coffee to show my gratitude. Hey Gonzalo, thanks for reading, your comment and the coffee. This hike was unplanned and happened to stumble upon it on a sunny Saturday afternoon and the nice thing was there was barely anyone about. It sounds like you and your family really enjoyed the beautiful nature during your time here which great to hear.